Roda X-cool RS-S07/09/12/18/24 A, — the newest system with the raised hlad-productivity. 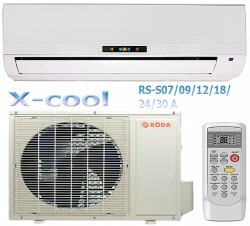 Excellent characteristics sleeps systems Roda X-cool of series RS-S-A, will even more amaze your imagination and will satisfy all overestimated inquiries on мощностным and to power-saving up characteristics to conditioners. Nano-technological perspective workings out and the innovative decisions, all it is applied and introduced in new, even more modern central air (split-system) Roda series X-cool. It is the present German break on the Russian market of split-systems. German quality and reliability, elegant design and excellent мощностные characteristics of conditioners X-cool RS-S07/09/12/18/24 A — have made split-systems of the given series (X-cool) leaders of sales among conditioners of a similar class of productivity and power consumption. Production of the company of the Sort — is certificated and corresponds to the declared characteristics of quality and reliability. To conduct week: A.Merkel, the German chancellor, has suggested to name one of аэрбассов — Stalingrad. Here it is the GIFT. Here it what — German solidarity with Russian people. Excellent class of power consumption — And. A powerful stream of air and оч. Good cooling (really, really freezes). Satisfactory design of the internal block. The big external block. There is a noise and small vibration, it was possible and to make more silently, the Chinese engineers clever, but a bit hard of hearing … a joke. At first I have paid attention on наружний the conditioner block. It really huge, the sizes impress, well thought that at "9" such. When I have seen it in a box at once and has not believed , have thought that it is an error and to me have brought the block from 12-shki, but небыло errors. Near to my conditioner costs same сплит 9, other brand, Grii or Fri seems, on is strong in English, but the difference is, and it is really appreciable, +++ I кондёр cools more strongly neighbour's, it pleases me, and the neighbour angers (has overpaid much), expensive Fri мля … the inverter of an eminent brand, and cools — rubbish. The second that has pleasantly surprised … these power savings. The class «And», but under the kw expense in a year … it, is, less, than Ryoda than at inverter Grii 9, by the way too a class And ++ … I do not know , it can artful Chinese «an advertising course», we will check up in due course but if it is valid so, +++ in favour of this Ryody. For 11500 roubles + 3.500 for installation — this сплит deserves an estimation «perfectly», and because of a large external box on which it is possible to put safely even a bed with colours, — I put firm 4-ku.